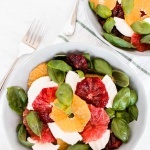 This Citrus Caprese Salad is a delicious fruit twist on the classic Caprese salad recipe. First, remove the peel from all of the citruses. Then slice them into circles. *1. You can replace the basil with mint for a different flavor. *2. If you prefer thickened balsamic (as pictured) simply pour the balsamic in a pan & bring it to a simmer at medium heat, then reduce the heat to low once it begins to bubble & let it simmer for 10-15 minutes until thickened. I reduce between 1/4 & 1/3 cup, but it depends on how much balsamic reduction you desire.